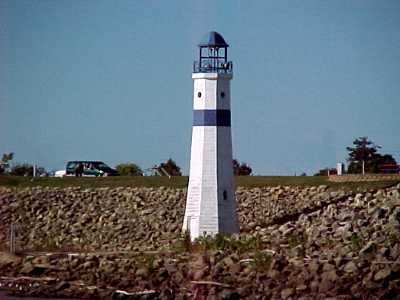 =====Lighthouses, in the popular mind, are associated with a rocky coast - or maybe rugged offshore coastal islands. 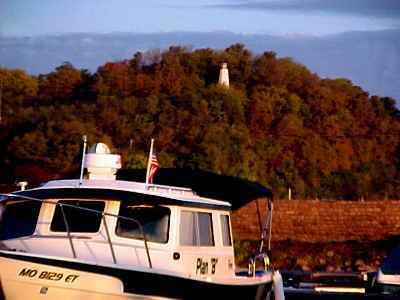 If you are a dilettante with lighthouses, you know that some of the most beautiful lighthouses in our country are on the Great Lakes. But, if you are a real aficionado, you know that hidden away in the mid-continent you can find the real rarity of the breed - River Lights. 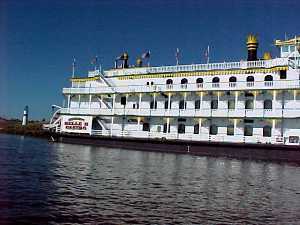 -----The Upper Mississippi has a few secret treasures, not much heralded in pictures or songs. But they are there, all the same. Lighthouses. Some serve the traditional function of guiding mariners, others are pure celebration of the theme. We were, frankly, surprised to find these reclusive gems and photographed each as we came upon them. -----The first lighthouse we saw was at Clinton, Iowa. 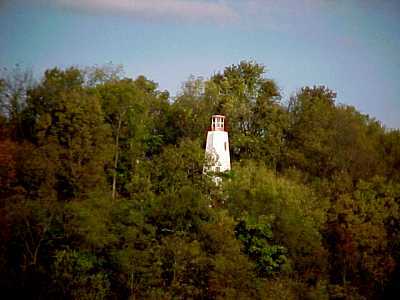 In fact, there were three identical lighthouses along the banks of the river. They were built in the 1930's by the W.P.A., we were told, to beautify the levee that had been constructed to protect the town. Previous flooding had submerged land as far as twenty miles inland. The lighthouses are attractive, but not used for navigation. Midwest Lighthouses are shy -- See them? -----The next light stood at the end of a breakwater shielding the Keokuk Yacht Club, in Keokuk, Iowa. Locals call the location Peevler's Point. We swung in around the lighthouse late in the day, tired from the excitement of a cruising day on the river. What a reception we received. The folks in this boating club are the friendliest, nicest folks you would ever wish to greet you at the end of a long day. They set us up with beer at the bar and we were soon visiting with these good folks as though we had known them for years. 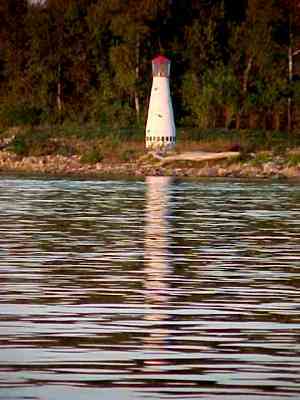 -----We asked about their lighthouse and they told us it was named for Bill Peevler, their commodore from 1999 to 2000. Sadly, Bill died while in office. 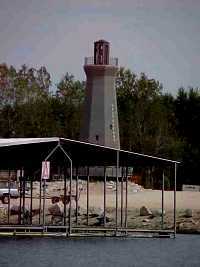 In the spring of 2001, they named and dedicated their lighthouse to his memory. -----We had heard stories about a good eating spot in Quincy, IL, called the Pier Restaurant. We were told it was on the left descending bank. "Go past the end of Quinsippi Island, beyond the abutments of the Highway 24 bridge and enter from the south." Don't cut the Quinsippi Corner or you'll fetch up on the shoal extending south from the island. Keep the lighthouse to your port as you enter." -----LIGHTHOUSE? Suddenly, Quincy had more than a good meal for us. We slipped under the bridge, turned north, and sure enough, there was a lighthouse sitting atop an abandoned bridge abutment. We inquired about it at lunch. We were told it had been built by the employees of Moorman Company as a display - and that it even has a revolving light! It was donated to the city who had it placed on the abutment. The Coast Guard approved the light and it appears on the Corps river chart. It is a real beauty. Oh - and the meal at the Pier, right across from the lighthouse, was excellent. -----Hannibal, Missouri, is well-known as the boyhood home of Mark Twain. 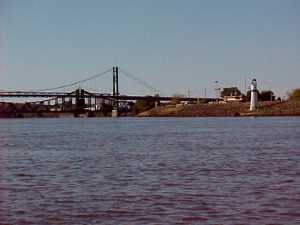 It is one of the few major tourist attractions along the Upper Mississippi. 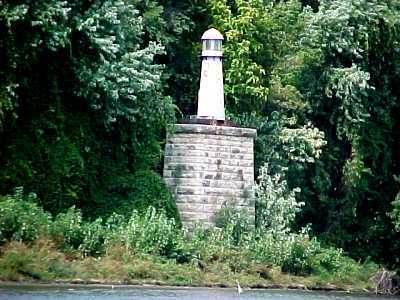 It is, however, also known to the few, as the home of the Mark Twain Memorial Lighthouse. As we tied off in the boat harbor, there it was - high on the hill above the town. 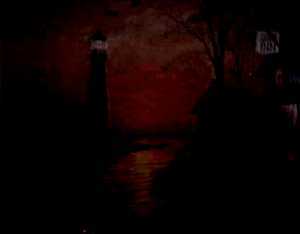 That evening, a pale light shown from the lighthouse. -----It has the distinction of being the highest inland light in the US. It was built to commemorate the 100th anniversary of the birth of Mark Twain and was dedicated in 1935 by President Franklin Delano Roosevelt. He was in the White House in Washington, D.C. as he read a commemorative statement and pressed a gold telegraph key to light the light. -----In 1962, a severe storm destroyed the lighthouse. The original architect, John Martin, redesigned and supervised the rebuilding of the lighthouse. It was re-dedicated and relit in 1963, again from the White House - this time by Pres. John F. Kennedy. 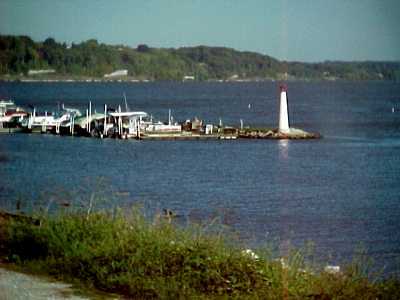 -----The lighthouse was renovated in 1993. For the third time, a President relit the light from the White House - now by Pre. Bill Clinton. Not many lights can boast of such connections. -----A few days later, we slithered into a harbor for lunch, and there was another lighthouse - the Deep Rivers Lighthouse. It stands beside the restaurant and guides us cruisers safely into a good meal. Now that's a great purpose for a lighthouse, although surely not the one usually associated with these friendly beacons. This light is purely for decoration. It was built in 1992, stands over fifty feet high and comes equipped with a mercury-vapor light inside. -----We had a good lunch, with a painting on the wall promoting a river light guiding the way to an Inn. Ah, the mystique of lighthouses. -----Heading to our pull-out spot at Port Charles Marina near St. Louis, we slipped into the Dardennes Slough parallel to the main channel of the Mississippi. 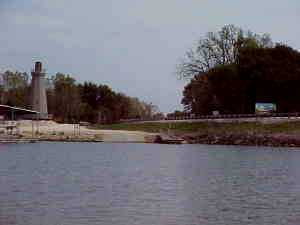 The last lighthouse we saw before pulling Halcyon was just downriver from the marina entrance. Folks there told us that it is a private light that was built by the Duck Club, a private marina, to mark the entrance to their harbor. It is a pretty lighthouse and fitting to be the last light we saw on the Upper Mississippi.